It's something we all gotta do, and I usually have trouble keeping up with it..
Our twin tub saves on both water and electricity. Water has been in short supply here since last winter was very dry. And yes, while our electricity is 'free' from the sun, it's actually more like pre-paying for it, and of course it's limited by the size of our system and available sunshine (we do get plenty of sun!). We got the twin tub at a clearing sale one hot summer day a few years ago now. I'm not sure if I remember correctly if it was $60, but I'm sure it didn't cost more than $80. It was so clean, it hardly looked used! I give my Mum credit for suggesting using the Sunshine bar of soap for washing. (She told me that she had to use it when I was a baby, or I would come out in a rash.. why doesn't that surprise me?) I just grate it up and it dissolves no problem. Oh, I see they changed the name, it's Sunlight now. I think it's just over $3 for 6 bars. I wasn't happy using the 'greywater safe', 'eco friendly' liquids and powders full of salts and phosphates on the garden. Soap works just as well for us as laundry powder or liquid. Rinsing is much easier because there are less bubbles, I'm getting away with just one single rinse, I'm not even using vinegar! Anyway, that's how I'm doing the laundry and saving money and resources. The less money we spend, the more time Marty and I can spend together. Marty has only two weeks left of work, something we've been looking forward to for some time now. Now that we've paid off the farm, we're going to give this thing another shot. One last solid attempt before deciding if our future is here or if we'd be happier somewhere else, doing something else entirely. The sad face on the weather station is apt, but it's got a pretty narrow happy zone, although it's happy today! It has since cooled down and we've even had some decent rain for the first time in a couple of months! You'd think that would mean a few good night's sleep, but alas not yet. We're both feeling a bit like zombies, and my fibro has flared up as well. Neither of us feel like doing much of anything except keeping the chickens and Squeak fed and watered, and we dragged the remaining few plants from the shade house to under the veranda. That makes watering them easy, and keeps the humidity up a little. Not to mention, the wild bird's water and some water for the neighbour's Guinea fowl who are still sitting on a clutch of eggs under the almond tree. Oh, and we're continuing to eat and drink as well. As much as we can given the conditions. I've been reading a book called "Strong Medicine" by Dr. Blake Donaldson - you can get a free copy from here - which I've been enjoying. While the rest of my body is happily repairing skin, strengthening nails, gaining muscle and loosing fat (I didn't think Marty and I had much to loose, but wow! ), I've been researching the side effects..
We've been eating carnivore since December, but I discovered I react to eggs in January, so it's only really been just over a month of eating meat, meat and more meat. I am on the road to mastery in cooking roasts in the Weber thanks to this website, learning about making a perfect pot of french press coffee (thanks to YouTube) because it has to be pretty good if you're drinking it black without honey, sugar or milk, and I have a couple of different salt varieties to choose from now, including this one. We don't have much urge to cheat, and if we crave anything, we just grab a bit of meat from the fridge and eat - craving gone! Shopping is simple, I buy all our meats from Wagga meat supply. There is so much less plastic packaging when buying in bulk, no more silly plastic trays! 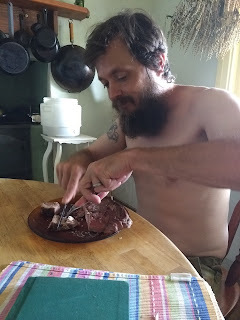 We're spending about $200-$250 a week on roughly 14kg (31 pounds) of meat for the both of us. It works out about the same, if not a little less than we were spending before, except this time, it's just the meat, the real food, no fillers, no junk! We're saving another $200 a month on vitamins and supplements. We stopped taking vitamin C, activated B complex, activated folate, ginseng for energy, fish oil, and extra vitamin B6 - all the most potent brands I could find. None of that stuff really helped except the magnesium, and we still take that when required. Everything I thought I knew is wrong, and it turns out the truth is the complete opposite in many cases. It reminds me of one of my very favourite Weird Al songs! Very hot, dry weather has me indoors for the day again. The mornings are nice enough to put on some jeans, feed and water the animals, water the remaining plants, and do the composting. The rest of the day is spent sweating and trying to get the indoor chores done. 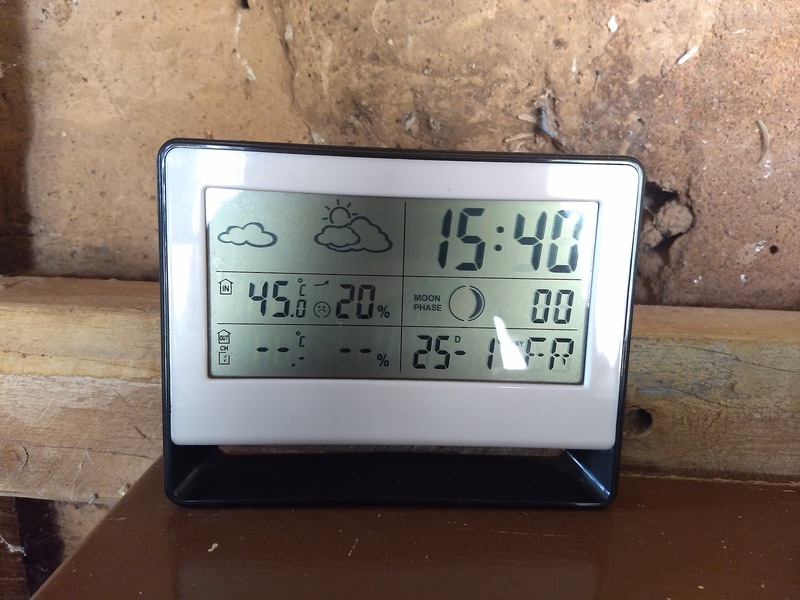 40°C+ (104°F+) weather outside is for the critters; the insects and the reptiles. The poor magpies and choughs seek shade under the veranda, and I have water set out for them. In a blatant waste of water, we spray down the area around the back door, keeping the plants, birds, insects and the solar system slightly cooler. The ants are so thirsty, they take the water immediately, and the bees will come drink off your skin if you spray yourself down first! 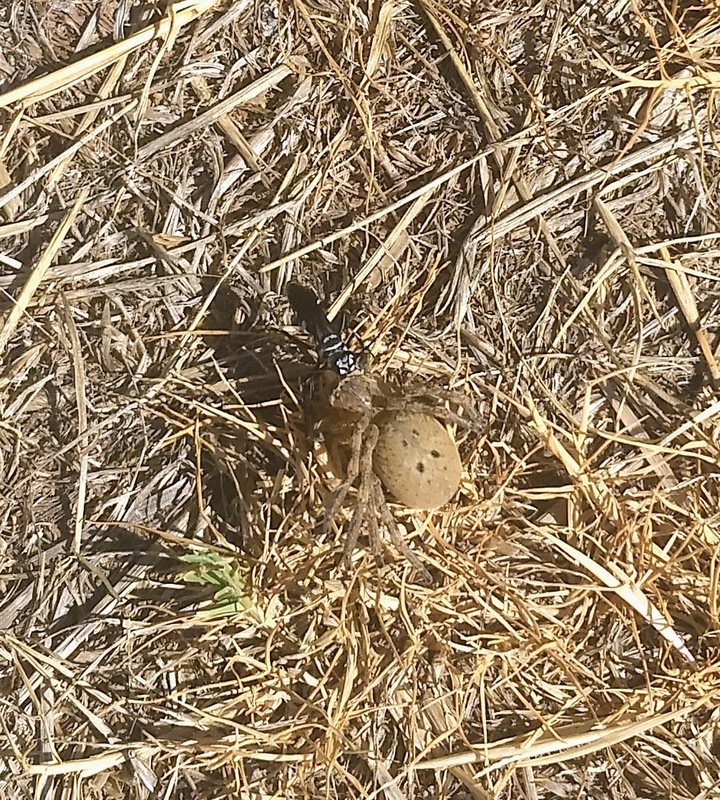 It's very difficult to get a good picture of the wasp above, but it's black and white and is dragging a big brown spider into a hole. 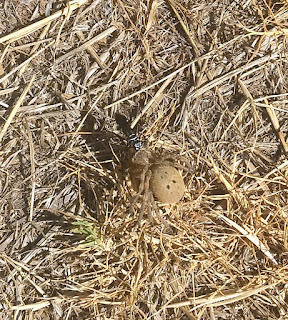 The spider is paralysed and can't do a thing about it, and will become a meal for the wasp's babies when they hatch. They're amazing, and they always find the biggest spiders that we generally don't see. 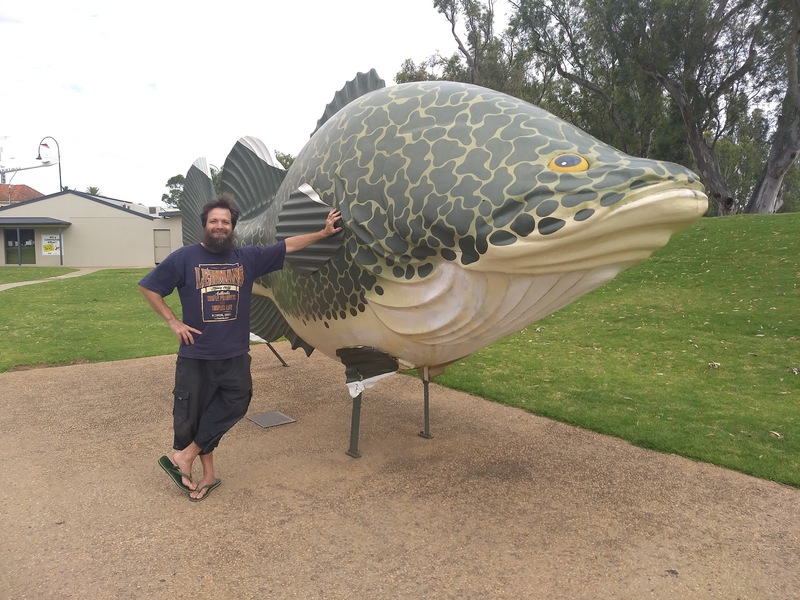 Marty and I at the big Murray Cod by the river in Tocumwal, NSW. Marty and I have lost a bit of weight lately, since starting the all meat diet. That wasn't our aim, but we're not complaining. It's more of a toning than anything, bloating, water weight, that kind of thing. We're both feeling better, no more wondering what made us feel terrible or bloated after a meal. I haven't had any more joint pains and the pain in my sciatic nerve from my lower back down to my legs has calmed down a lot. We have more energy than usual, more often than usual. We're on our way to better health, anyway. 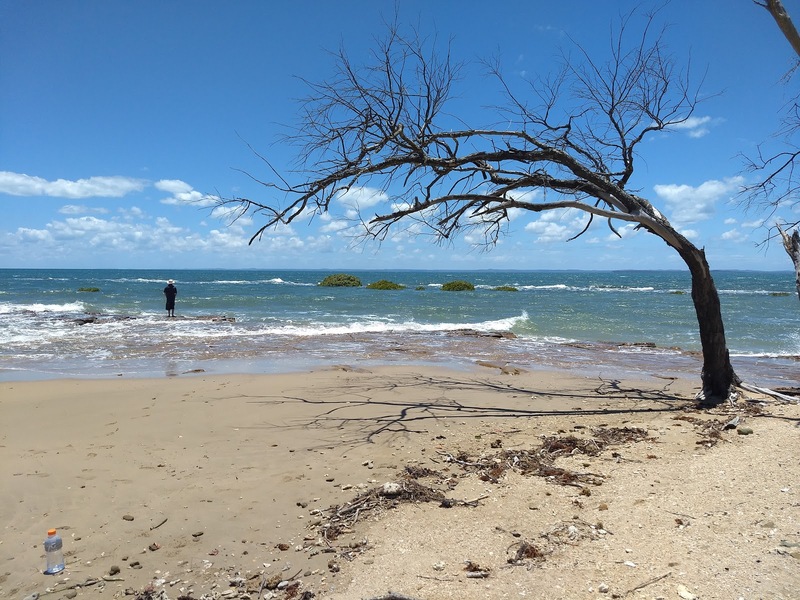 We're both torn between staying here and leaving for the greenery and healing ocean waters of Queensland. On the one hand, this little home on 20 acres is paid for. We can keep sheep and/or cattle if we wanted. We're free to do as we please, for the most part, and we do love it here. It's not an easy decision, and it occupies much of our thoughts. In the meantime, we will keep working on making this place better, and hopefully Marty will be finished working in town soon, and we can really start to make some progress. Marty returned to work this morning, so I thought I'd take this opportunity to catch you all up on the holiday happenings. 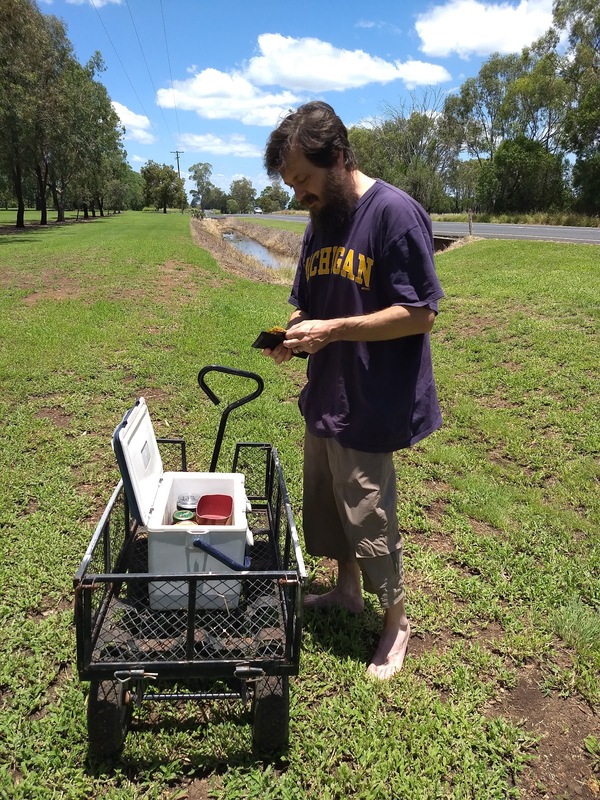 It's been a wild December, with my Mum making a big move to Queensland, we did what we could to help out. Since we're only a couple of hours from the home she's now selling, we could get down there and make it look all pretty for prospective buyers. 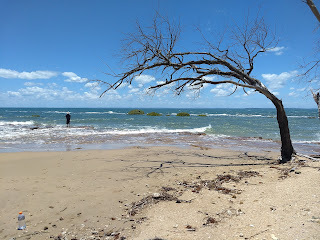 Then, while Marty had a little time off from work, we spent a week up at Mum's new place, in the sun and sand. The roadside honey was delicious! Marty with his feet in the water. It was lovely up there, so green and the humidity was quite bearable. Actually, we're both glad we took our jumpers with us, because it got a little chilly at night. It made a wonderful change to the weather at home, since it's so hot and dry, there's not much green left. While we were gone, the forecast said 43°C (109.4°F) at home, and I know we're consistently warmer than the forecast ever says. 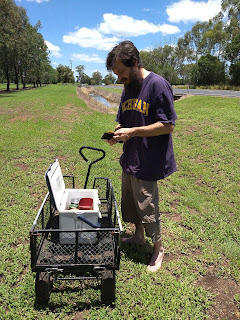 Many plants simply cooked in the heat, despite being irrigated on a timer. Luckily the chooks fared ok, although somehow a fox (I guess) took our elderly hen, Toupee. It was sad, but thankfully everyone else is ok. The electric fence is usually fox-proof, so it must have been one desperately hungry fox! 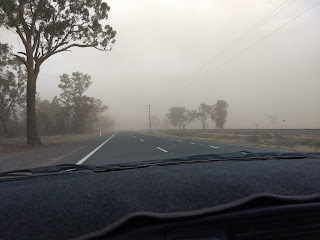 We drove home to be greeted with the usual dusty dry conditions. 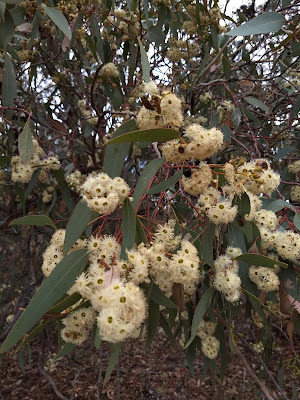 The photo above was taken north of us, near West Wylong. That's soil, and it seems to have become a new normal. They just call it "areas of raised dust" in the weather forecast. It occurs when the soil is left exposed, around here it's done by plowing (which for some unknown reason, we've seen plenty of this December), or letting stock eat at the same ground for far too long, until there's no cover left. It upsets me, but money comes first in this world, not soil heath, not animal/stock or even human health. I'm always researching and learning about all kinds of things, and health and food is one of the most important things. I know that you are what you eat, and since Marty came to live in Australia, we've been trying to fix my health with diet. 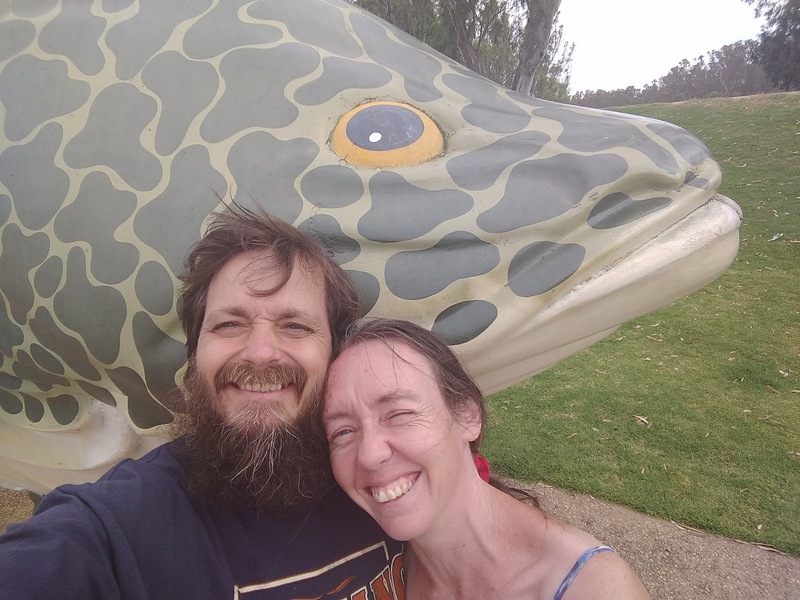 We've tried an elimination diet that my Doctor had us on for 6 years with some good results, but our energy levels were never great, and I still was in pain for too much of my life. We tried Paleo when we moved here to the farm, and the goal was to grow as much food for ourselves as we could. Thinking it was the poor quality food we were eating.. but that left us feeling really terrible, and in order to get more energy, we went back to eating sourdough bread and even started adding lentils and beans to our diet. Still not satisfied with my health, poor strength or lack of energy, I did some more research and found out about the Carnivore diet. So, after a bit of re-training my brain, to begin to accept that meat is nutrient dense, that we don't need plants after all, and that yes, it really could be that simple.. Marty and I got stuck in. We've been eating meat for about a month now, and there have been days where we can really feel the benefits of this way of eating. Super energy, super strength (I did the first chin-up of my life! ), less anxiety and depression, and no pain anywhere. Other days haven't been so great, and I've had short bouts of fibro pain and on others it feels like we're walking through mud. So, yes, we're still in the transition period, but it seems to get a little better every day. So far, though, this is an improvement on how we were feeling before, so we're sticking to this for a while. Given the change in diet, our whole perspective on things has changed a bit. It'll be interesting to see what happens over the next few months! Right now, I'm less worried about having water in the tanks, because we're not relying on the water to grow any of our own food. As long as we've got enough to wash our hands and water the chooks (and Squeak!) then it's enough. Besides, since when did worrying bring the rain anyway? Oh it was beautiful! 50mm of lovely rain followed by a light show of 4 thunderstorms in the distance between Tumbarumba to our east, and Albury in the southeast, making the grain silo look like an evil castle in an old movie. The tanks are in a much more healthy state, and the plants that made it until now are very happy indeed. The rain spurred some native gum trees to flower, as are the peppercorn trees, which are humming with bees again. Speaking of bees, the Blue Banded bees have awoken finally, I was beginning to worry, but they were only sleeping-in. We've been spending our weekends sorting the irrigation in the shadehouse, and now we've had a little rain, I feel more confident planting some things in there. The chooks will be moved to their favourite summer spot under the figs next month. Although I prefer to move them more often, they will most likely stay under the figs for the whole summer, because it's the most shady place available. Yesterday's snake didn't even see us! Marty and I were feeding the worm farm when I saw a golden brown shimmer in between the dry belladonna leaves. I didn't feel very comfortable standing there anymore, but Marty finished up so I kept my eye on the garden. All of a sudden, the snake realised we were there and took off so fast in the opposite direction, Marty didn't even have time to turn his head to watch it disappear. It may have been the same one we spotted by the water tank earlier that day. That's a pretty popular spot, offering warmth of the water storage, some mid morning sun, as well as a quick escape route behind the pump locker. I intend on making the walkway there a little wider, less grassy and more visible, just in case. The recent rains soaked into the land like a sponge, with not a puddle left behind. it's certainly given rise to some optimism and good cheer. The weather people are saying there's a high chance of another decent drop tomorrow and Wednesday. We're certainly hoping so. I bet the Peron's tree frog would also like some more. I hear it's call just the once every day, but we've seen them in the worm farm (probably enjoying a worm feast) and even in the chook's water buckets. I love to hear critters enjoying the garden, and it's been lovely hearing people on talkback radio say they're keeping their gardens messy for the frogs!